The Ryedale Heather comes in a fresh sherbet colour scheme combined with cream tyres and contrasting brown grips and sprung saddle to complete this bike's stylish look. Lovely bike, the brakes are particularly good and give you a very safe feeling when needing to apply them.Would definitely recommend. My bike is my absolutely favourite shopping companion. 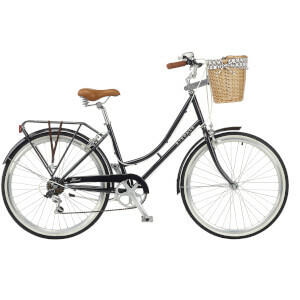 I own a Heather and the bike was at a great price for the comfort it offers. The components are all classy and she's so beautiful. I ride all day long, from my dance classes to my workplace. But I especially love cycling to the market. Helps me be swift in the lanes and the pretty basket accommodates a lot of my stuff. Also, the brakes are reflexive, so the crowds are not a problem. My Heather's just awesome and perfect. My sister bought the Heather last month and they are literally inseparable. For a rider, she can be quite reckless a whole lot of time, and her reflexes work really late, so thank God that the bike has such promptly responsive brakes. The gear shift is not complex at all. Sometimes I sneak out for a session of my own, and the seat is so welcoming, spares me the body ache. We totally love it!